The stock market returned 0.36% at the close of trading today, following gains in five equities. The GSE-Composite Index and the GSE-Financial Stock Index closed at 2,275.74 points and 2,100.02 points respectively. The 8.15 points leap in the market benchmark pushed the year-to-date return to 34.73%. A total of 0.76 million shares were traded for GHS1.16 million. Trade volume and value doubled compared to trades from the previous session respectively. TOTAL dominated trading with 51.45% of the shares traded and 75.26% of the total trade value. 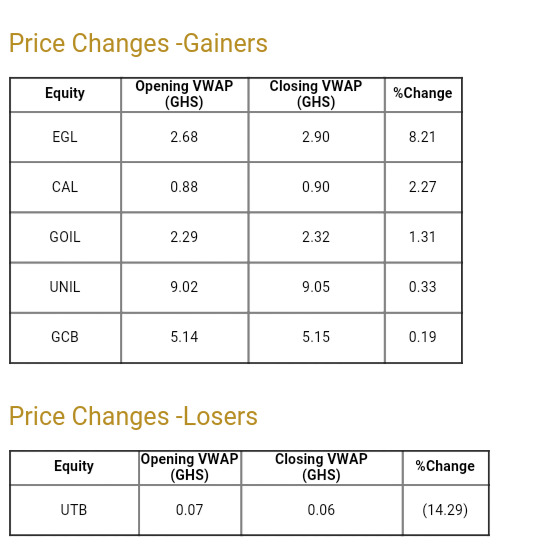 EGL reached a new year-high after gaining GHS0.22 to close at GHS2.90. Other gainers were CAL, GCB, GOIL, and UNIL. UTB was the sole loser. Posted on August 9, 2017 September 1, 2017 by Patrick Edem AgamaPosted in Stock analysis, Stock Brokers, Stock MarketTagged Ghana Stock Exchange, Stock Market.